Hamilton was among the 150 businesses and organizations named in a special section of the Sunday, April 30 newspaper and online at www.jsonline.com/business/top-workplaces-2017. The district’s ranking overall was 15th among the 150 workplaces. 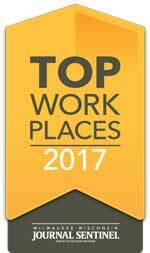 Evaluation for the Top Workplaces program is based on feedback from an anonymous employee survey conducted by Workplace Dynamics, an independent research firm.